Breakfast and the Revolutionary Period | Come Here To Me! « #Jacobin1916 launch this Saturday. Last Saturday, myself and Ciaran spoke at a talk entitled ‘The Past, Present and Future of the Irish Breakfast’ at the The Royal Society of Antiquaries on Merrion Square as part of the St. Patrick’s Festival. I focused on stories from the Revolutionary Period (1916-23). To do this, I searched through the Witness Statements of the Bureau of Military History. The word ‘breakfast’ comes up 286 times in the statements and I picked out eight of the best anecdotes. 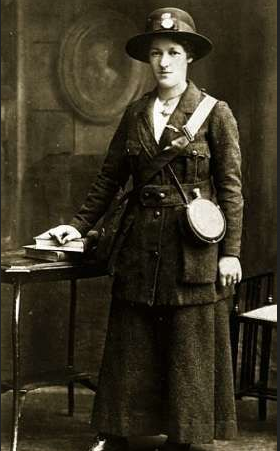 Mairead Ni Cheallaigh (Mairead O’Kelly), a Dublin-based member of Cumann na mBan during 1916 and sister to future Irish president Sean T. O’Ceallaigh, recorded an entertaining story from Easter Monday morning. It provided us with details of the Pearse brothers’ breakfast – their last ever home-cooked meal. I have kept the table and tablecloth that were used by the Pearses at the last meal they ate in our house. On Easter Morning … my mother called me to give instructions about the breakfast for the Pearses. She said she had prepared a tureen of bacon and eggs which she had left on a trivet in front of the dining room fire. She had also a tureen of mutton chops. She said they must be very hungry and God knows when they will get a meal again. She must have known more than I did. She went out and I went into the dining room where the table was set. Shortly afterwards I heard the Pearses come downstairs. They stood shyly outside the door until I called them in … I placed the two tureens on the table and they ate every bit of the food … including a whole loaf of bread. Tuesday April 25th – Quinn’s bakery cart was held up and some bread captured, also two cans of milk from a passing cart. Wednesday – 19 chickens captured from messenger boy … we cooked the chickens for dinner, having to take them up out of the pots with bayonets, not having any forks or utensils. Friday – Up early for breakfast ; we fried veal cutlets and gave the men a good feed. We had a meat dinner with potatoes. 9 live chickens commandeered. “We were ravenously hungry. I searched the haversack for a few crumbs. The only thing I got was a boiled potato and when i went to divide it I found it was bad in the centre. I stood up and called on my pals “Come on, lads, I’m going to get breakfast if I were to shoot my way to it”. “I walked to the house, the door was open and a young woman was standing at the fire. The table was laid for breakfast and I feasted my eyes on a most beautiful home-made cake … I had to exercise all my will-power to restrain the savage desire to go and grab the cake”. “That cake I mentioned was a feed for six men but by the time that we had devoured two blue duck eggs each and our share of the cake I doubt if there was enough left to to give to the man of the house his breakfast, who by the way, came in as we were eating, and the only thing that troubled him was that we would kill ourselves eating”. While the Witness Statements of Volunteers who were on active service or on-the-run describe breakfast in enthusiastic terms, it’s understandably the opposite when it comes to their experiences in jail. Patrick Colgan, a member of the Irish Volunteer from Maynooth, was sent to Stafford jail. His breakfasted consisted of “a portion of black, badly baked bread and a small piece of maragine, about half a pint of very weak, unsweetened tea”. Liam Tannam, Dublin Brigade IRA, fared a little bit better in Knutsford jail in Cheshire, England. Breakfast comprised “eggs and ham, tins of jam, genuine butter and porridge”. Seamus Kavanagh, a member of the IRA in Dublin, was sent to Newtownhamilton, Armagh for the 1918 Election to help ensure there was no interference with the Sinn Fein election campaign. A decent breakfast was a life-safer for the men who had been living on bread, jam and tea for two days. On the morning of the third day when someone said that a good breakfast could be had in the town for 2/6d per head there was a charge made for the restaurant where we got ham, rashers, eggs, tea, bread and better … I was never so glad that I that I had 2/6d then I was on that morning. Robert Brennan, active with Sinn Fein Press Bureau and the anti-Treaty IRA, was called upon by De Valera to visit him in Clonmel. His train was held up due to a blown up railway bridge and the passengers had to sleep on the train overnight. He recalls a humourous story of one hungry heretic who questioned why the priest in their company received more food than them. In the morning, the dozen … travellers betook themselves to a nearby farmhouse, where we breakfasted on tea, bacon and eggs. The farmer’s wife apologised because there was only one egg apiece. A red-haired, jovial fellow growled that the only priest in the party had got two eggs. He solemnly told the farmer’s wife that she had undermined his faith and that he was going to turn Protestant. The lady pounded him on the back and said he was not going to imperil his immortal soul for the sake of an egg. “It’s not for an egg” he said “it’s the principle of the thing”. 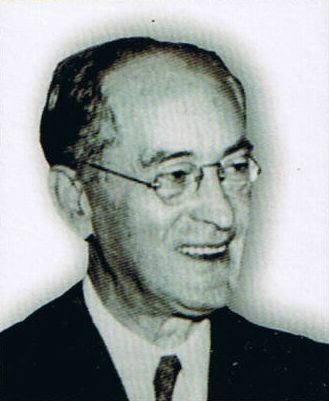 Robert Brennan in later life. Credit – http://www.yvonnejerrold.com. I heard that the Kimmage Garrison lads got two eggs and two rashers on the morning of the Rising! And don’t forget the hunger of the civilians. This is Larry Medlar, recorded on his 90th birthday in 1978. There was apparently no grub in the house in Ross Road at the time of the Rising, and he went out to get some in Patrick St. He met my granny, Sara Mortimer, his brother’s sister-in-law, and she suggested they head up to James’s St. where Larry was living, though he had been staying with his wife’s folks in Ross Road at the time off the Rising. 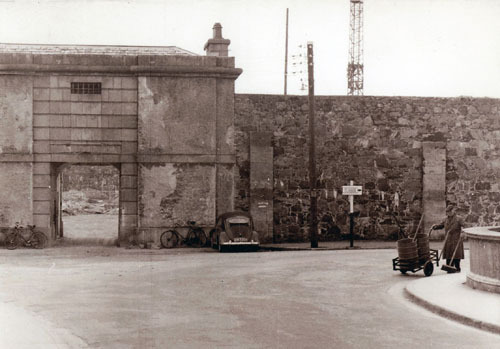 Granny was living in Thirlstane Terrace at Thomas Court and her people lived at the Fountain in James’s St. So they were heading up the back way around Echlin St. when they were stopped by the soldier. Note that he knew Seán Connolly, who was the first rebel to die in the Rising. The Medlars came from a very Republican family in Paulstown, Co. Kilkenny, though Larry, as you can hear, did not take part in the Rising. A ‘cake’ in this context is a cake of soda bread. Rose Mc Namara certainly made sure her Volunteers were well fed ! Audio link in my comment above didn’t translate as clickable. However if you click here you should get it, and then just click on play.